Need custom sweatpants with pockets? With cuffs? No sweat! Get 25 Sweatpants for $19.98 each. The no-sweat way to customize your apparel. Sweatpants used to be reserved for athletes, astronauts, and Sunday night lounging. But today you’ll see them being used for everything from fashion statements to school rallies. Merchly’s custom-printed sweatpants are a useful (and comfortable) way to showcase your band, event, or organization year-round and come in two cool styles: elastic cuff or open-bottom with pockets. You can easily customize your sweatpants in our free online designer: upload your artwork to start designing, or choose from our extensive collection of options to design your sweatpants. Need a custom look and don’t know where to start? Check out our design services. Looking for custom hoodies to compliment your sweatpants? Stay comfortable from head to toe while sporting your unique design or logo. Our hoodies and sweatshirts are the same high quality as our custom sweatpants and make great companions. Why trust Merchly for your custom sweatpants? Relax. 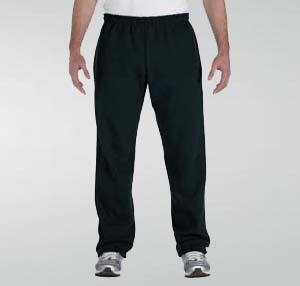 Order custom sweatpants anytime—we’ll keep pace with your schedule.